STEM education can open doors to a more diverse workforce, according to former US CTO Megan Smith, seen here at Analytics Experience 2017. I’ve attended countless events in my career, but not many have included a more than 200-year-old quote about technology that still rings true today. And that quote from our country's founding father still rings true today said Smith. STEM provides children with an avenue to explore science and technology that can lead to future employment. STEM also awakens different social groups to science and technology, leading to a more diverse workforce, and more successful businesses. At SAS, we’ve seen just how federal, state and local governments use analytics to improve the welfare of the nation’s citizens, from identifying human trafficking rings to preventing fraud, waste and abuse to fighting opioid abuse. An increase in STEM participation will lead to more people seizing opportunities in the analytics economy. Those talented people will generate new advances in analytics that will further transform our government’s ability to deliver high-impact services. Smith’s message echoed that sentiment. By investing in STEM there's a direct result in the amount of students – and future workers – that are interested in new technologies, can think critically about problems and use proven analytical methods to get results. One story of Smith’s that I particularly enjoyed came from the White House Science Fair. A group of young girls, given the opportunity to collaborate and share ideas, put together a prototype of a page-turning robot for children with disabilities. “The president asked these kids how they did it, and the kids told him ‘we just did some brainstormin’,” Smith said. She explained that by simply having the chance to try and make something new and creative, these girls were excited and interested in science and technology. Analytics can provide answers for today’s problems, but can also help address future priorities as well. As Smith said, “Investments in STEM education can provide dividends down the road.” It turns out that George Washington was right. 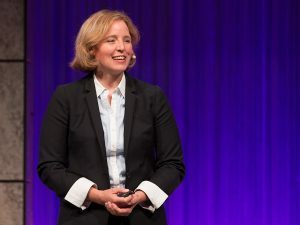 To view Megan Smith’s entire keynote presentation, click here.